Check out this Amazing Boho Chic Fashion Collaboration with Brandon Lewis of Phlyego styling, Michelle Chapman from All Earz Jewelry, Hair and Makeup Artistry by Kasia Manser (you can find her at SG Hair Spa in Marietta, Ga), Model Casey Bragg and yours truly, Kristie Andraschko of Turning Leaf Photography . Whether you are searching for senior portrait, fashion model or portfolio photography, head shots, photography and session styling, amazing artisan jewelry accessories for yourself or your photography session, photography hair and makeup, you can see the team works amazingly well together! Visit Turning Leaf on Facebook and 678-920-8216 for bookings. I’m playing catch up from the 2012 holiday and end of year slam! Here is a Zach Efron doppelganger? Maybe so? This is from a great senior session from a while ago with Nick from Kings Academy located in Woodstock, Ga. Nick is on the football team and has been taking college courses already, putting him on the fast track into the field of dentistry! Best of luck to Nick! Turning Leaf Photography in Atlanta, Ga was voted the Best of 2012 by Kudzu – read the stellar reviews here! Want to see more of my work? Visit the website here! Earlier this year I received one of THE most exciting calls in my professional photography career! 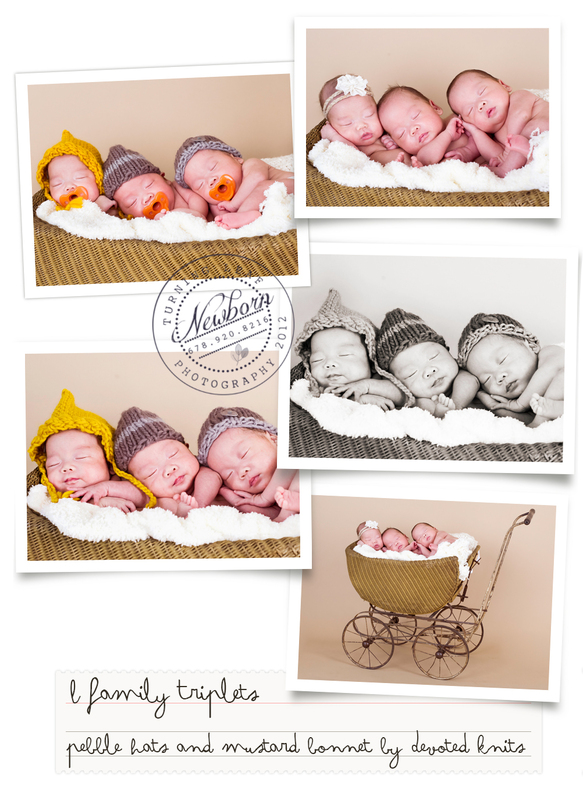 A call for booking a maternity/newborn sessions for triplet newborns that were due in October 2012. But wait…not only triplets… identical twin boys and a sister. Mom was so excited about planning her perfect maternity session and she was doing due diligence in scheduling far in advance! We picked the perfect location and were busy making plans…and we had her on the calendar for July. However, mom ended up on bed rest right when her maternity session was scheduled…and shortly thereafter, she was in the hospital on bed rest for monitoring, with an unsure date for delivery! No maternity session could be done outdoors like we had planned and mom was bummed. I told her it was ok, I will make it up to her (hoping I could in fact do so!). Happily, I did go and meet mom at the hospital and we had a great visit. I was also able to talk her into having a few pictures made in her hospital room and gown (promised not for public viewing). Now mind you a hospital gown is not the most flattering of attire for maternity pictures, but I felt it was an important part of the family journey and she happily agreed once we met. I received a call late in August that it was time and the baby’s were coming – the C-section has been moved up from 9/15! I was one of the first to find out the delivery date of August 31, 2012 mind you and this was much earlier than what the real due date should have been in October. I was literally jumping for joy though, as we planned on pictures of the babies in the NICU. When I was at the NICU taking pictures, I was told that as parents, they had not been answering calls, emails or texts from friends and family. That only their parents knew the babies had been born! They felt badly not letting everyone know that they had arrived…they just wanted everything to be calm and deliver the good news when the time was right. I am so blessed and honored to have been able to capture some of the most precious newborn pictures I have ever had the pleasure of taking! The baby’s were just 7 days old when these pictures were taken and just over 3 lb each when born. I really felt so honored knowing about the babies being born, I wanted so badly for the friends and family of the baby’s to also know and see what I had seen…a little window into this miracle that had taken place! While mom and dad had just wanted to have one image or two to send out in an email format, that was not going to cut it for me! No way…everyone had to see the ‘big picture’! I came up with the concept of a ‘slideshow birth announcement’, an idea which mom and dad loved and I quickly turned this around for them to email the great news to others! I heard the slideshow was received with overwhelming tears of joy by all. And how wonderful it was to have been able to see the photos of the baby’s as the announcement of their birth. As predicted, it took a little while for the little ones to grow to normal baby weight and be ready to head home. But finally all the baby’s were home and healthy. They were ready for their in-studio session! We were right on target, as the real ‘due date’ for the babies, if they had gone full term, would have been just two weeks prior to our studio pictures! Originally, I had scheduled my sister, Kara Sutton, to come and help with the triplet session as she is a Post Par-tum Doula and excellent with babies too, however she was under the weather and recovering from a last minute surgery herself. So..here I was flying solo and felt very confident about tackling the trio! I must admit, the baby’s were completely amazing – and I was smitten!! We were able to capture so many great pictures. Mom even deemed me ‘the baby whisperer’ as I honestly could not keep the baby’s awake for open eye pictures! The visit to the studio was the first visit out and about that wasn’t involving a pediatrician! The triplets sure were looking quite ‘grown up’ comparable to the first meeting we had! Notice, the twin boys on the bottom left. But also notice just ‘how identical’ all three of them look when side by side! I have to give a super HUGE kudos to mom and dad for doing such an amazing job with these babies! They are each so incredibly precious. 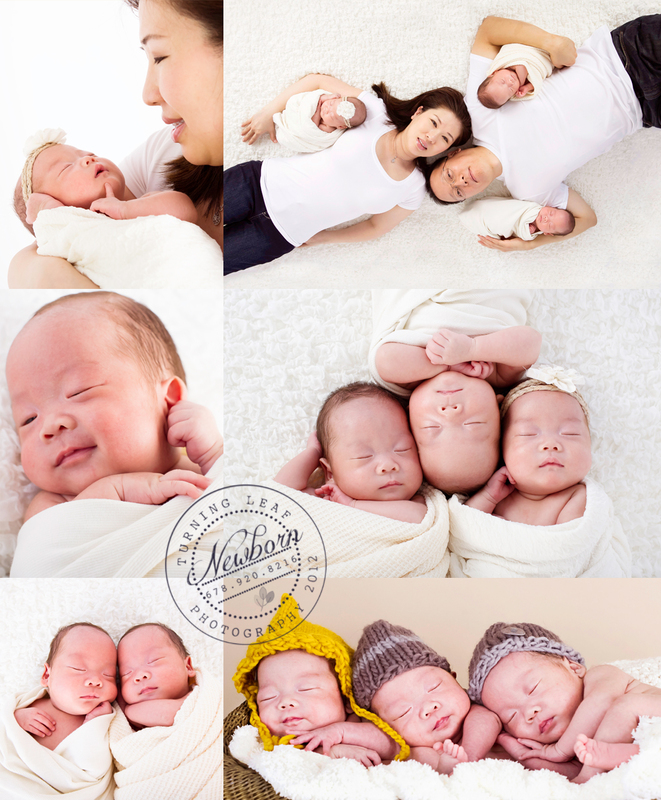 And while I cannot imagine having triplets myself, I am absolutely honored to have met this beautiful family and capture their most precious moments! I cannot wait to see this trio grow up and look forward to capturing their milestones! And last but not least, a huge shout out to Devoted Knits and Trae for being so generous in working with me in the collaboration on the newborn hats which are included in the above pictures: mustard bonnet and grey pebble beanie duo. If you are in search of some amazing handmade knit newborn props, head to her site and check it out – tell her Turning Leaf Photography sent you – you will not be disappointed!! Interested in maternity and newborn photography? Please visit our website www.turningleafphotography.com and join us on Facebook. Make sure to read our excellent reviews on Google as well! I look forward to hearing from you! I am honored and blessed to work with this precious family on their bundles of joy times three! Not only am I excited to be photographing multiples, including triplets – there are identical twin boys and a sister in this blessed trio! Mom was smart and thinking way ahead of schedule by planning her maternity session for July considering a fall due date, however even the best laid plans do not work as you expect. She was sent to the hospital on indefinite bed rest in the summer and was held there until the babies were born in September via C-section. Mom and I did meet prior to the babies being born and had an in-hospital maternity session for a few pictures :). Below are just a few of the miraculous pictures of the precious little ones from my visit with the family of five at the NICU. The babies were between 3.6 oz – 3.9 oz in weight at birth, and you can see how tiny and healthy they are! I was able to create a wonderful slideshow for the parents to send out to family and friends announcing the birth of the babies as many of them did not even know about the birth until seeing the slideshow pictures that the babies had indeed been born! All babies are doing well – two are home already! We have upcoming sessions scheduled for the month of October. I’m so excited to see this family grow and blossom! Stay tuned for more pictures in the near future! Congratulations to the proud parents and this beautiful family! Would you like more information on scheduling your own newborn session with Turning Leaf Photography? Please join us on Facebook, visit our website and read our numerous stellar Google reviews! Because a photograph never grows up! The anticipation these parents had while waiting for their daughter to arrive was contagious! We met at their home in Smyrna for some maternity pictures and then headed to a park north of Atlanta, just finishing up before a pop up thunderstorm. Let me tell you, these parents are over the moon for this little one! Mira was miles of smiles for her newborn session! Congratulations to this brand new family! Looking for a newborn or maternity photographer in the Atlanta metro area of Georgia? Check out our awesome multiple reviews on Google and visit our Facebook page for the most up to date work and to see what is going on! Want more information on booking your own session? Then head here where you will find all of the details on the website!